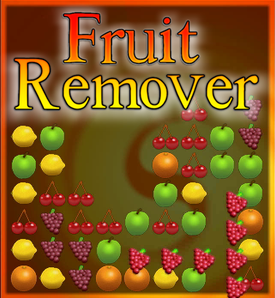 Fruit Remover is puzzle game released for iOS devices. It features several game modes, online leader boards, achievements, and best of all it's completely free. Download it today! Fruit Remover 1.5 is now available for iOS. This release adds native support for the screens on the iPhone X, iPhone XS, iPhone XS Max, and iPhone XR. It also introduces support for the additional screen size on 2018 iPad Pro models. The graphics engine was updated to target the increased capabilities of the oldest currently supported iOS devices. The title screen now features additional animation. Fruit Remover 1.4 is now available on the iOS App Store. The new release adds native support for the screens on the iPhone 6 and iPhone 6 Plus, and also slightly reduces the App download size. Fruit Remover 1.3 is now available. This version adds 12 new challenge mode stages, and is optimized for iOS7 and 64-bit devices. Fruit Remover 1.2 is now available on the App Store. This version adds native support for the iPad, in addition to supporting the larger screen on the iPhone 5. An updated version (1.1) of Fruit Remover is now available on the App Store. This version improves compatibility with iOS 5 devices, and adds the ability to restart a challenge without going back to the main menu.